Poor girl. 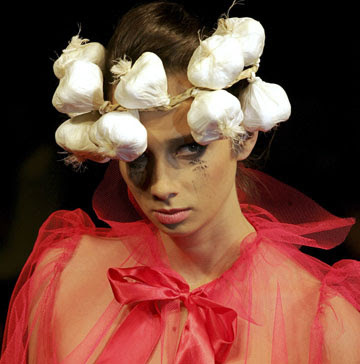 Forgot to take off her mascara and woke up with garlic head. If you love alliums, you are going to love this post. It is time. Get all those sprouted garlics from your fridge! Plant them pointy side up. That's about it! If they flower, break it off and dig them in the Spring when they start to die. The garlic will thank you if you bury them in loose, rich soil. That they grow in rocky, sandy soil and don't like fertilizer is folklore. Same with herbs. If you want a lot of basil you must feed it. Rosemary and lavender are about the only herbs that can take that kind of abuse. Garlic can't. It takes some practice. I don't know why. I did the same thing every year and the garlic didn't grow well. Then the third or fourth year BOOM! Garlic! And it has been everywhere since then. I can plant it in Mom's garden; grows. We moved to Atlanta; grows. Once you have paid your garlic dues, you are due some garlic! You will know if you are still in the practice phase because you will start with one clove of garlic and end up with one BIG clove of garlic. If you dig a few (in the Spring) and they are all single garlic bulbs, juts leave them in the ground. They will come back up in the fall. I have an allium patch because I don't always remember exactly where they are and I don't want to accidentally harm them. The leeks are in there too. I'm not even sure which are the garlics and which are the leeks, but I expect I will figure it out when they come up this fall. It doesn't really matter. Whatever grows out of that corner of the garden is going to get sautéed in butter, mixed with veggies and eaten! Yum! Thank you! I was hoping people would recognise that.